A Phoenix father is making sure everyone knows about his daughter’s case of bullying. Markus Hines says his daughter, a freshman at Phoenix-based Betty Fairfax High School, was cyber-bullied with memes all through the beginning of the school year. 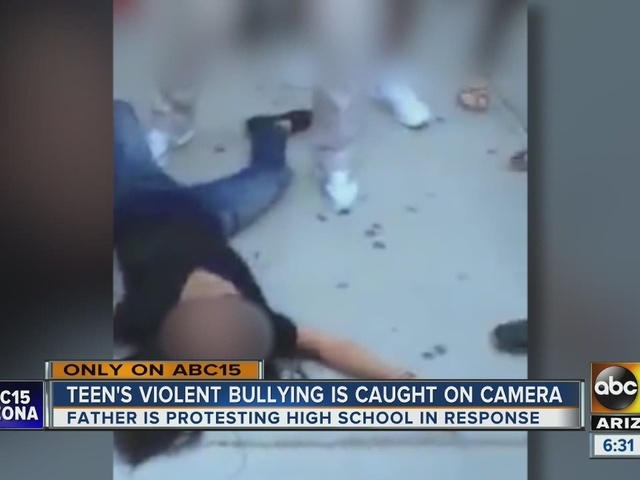 She attempted to confront the bullies at school Tuesday, which led to a fight and ended with Hines’ daughter gasping for air on the ground. You can see it in a short cell phone video shot by classmates. “I don't know I wouldn't want I just wouldn't want another parent to go through this,” said Hines. Since then, Hines has been walking on a road next to the school with a sign no one can miss. It reads “My daughter was bullied at Fairfax.” It’s been on display the entire week. Hines says he won’t stop until more is done about the problem. “I felt like this was the best thing that I could do to do to spark some conversation. I wanted parents with the kids driving up to see me and maybe there's another kid that's getting a ride with their parents that's getting bullied,” said Hines. Hines’ daughter was back in school Friday but he says she had to leave early after some students gave her a hard time about the incident.